“I’m happy to go to the classes of the Hebrew Speaking Club "What's about to talk?”. I have been visiting this club for two years, I think that Kyiv is the most successful and successful project for those who want to maintain and develop the spoken Hebrew. I like the choice of topics: either relevant for repatriation, or devoted to Jewish holidays (Hanukkah was celebrated very warmly), or just interesting as a subject of discussion (the latest is about contemporary art). The speakers prepare very interesting materials, invite guests from Israel. And at meetings they pay attention to u, regardless of the level of training.Therefore, despite the fact that people come from different levels of Hebrew, the conversation always becomes common.And this not only develops, but also unites members of the club.I finished ulpan alef, but I only get conversational practice Club. I am very grateful to the organizers, Ksyusha and Elena Zaslavskaya." Шалом! Меня зовут Мария. Клуб разговорного иврита "А поговорить?!" посещаю уже второй год. Я училась в ульпане в Мелитополе, где в течении двух лет, мы с нашим прекрасным преподавателем Людмилой Шапиро изучали не только иврит, но и знакомились с историей, традициями и религией еврейского народа. Теперь по воскресеньям хожу в Клуб. Жду всегда наши встречи с большим нетерпением, ведь каждый раз это что-то новое, яркое и интересное! Людмила, как настоящий профессионал, тщательно готовится к нашим встречам. Она всегда подбирает необычные и увлекательные задания, красочные материалы и, конечно, сладкие бонусы в конце) Для меня встречи в клубе это возможность практиковать иврит, общаться с интересными людьми, развиваться и просто хорошо провести время. А ведь в наше время этого так не хватает! Большое спасибо Клубу, Людмиле и спонсорам за предоставленные возможности! Shalom! My name is Maria. I have been visiting the Club for two years. I have studied at Ulpan in Melitopol for two years with our excellent teacher Lyudmila Shapiro. We not only studied Hebrew, but also got acquainted with the history, traditions and religion of the Jewish people. Now on Sundays I go to the Club. I always look forward to our meetings with great impatience, because every time this is something new, bright and interesting! Ludmila, as a true professional, carefully prepares for our meetings. She always picks up unusual and exciting tasks, colorful materials and, of course, sweet bonuses at the end. For me, meeting at the club is an opportunity to practice Hebrew, to communicate with interesting people, to develop and just have a good time. But in our time this is not enough! Many thanks to the Club, Lyudmila and sponsors for the opportunities provided! Мы, бывшие ученики ульпана г. Мелитополя, хотим поблагодарить спонсоров за основание клуба разговорного иврита в г. Мелитополе. Клуб даёт нам возможность развивать и укреплять свои знания иврита, полученные в ульпане. Ведь если какой-то язык не является повседневным разговорным, а изучается в процессе, и знание не укрепляется практически, то естественно язык забывается. Поэтому клуб людям, которые проживают вне пределов Израиля, очень необходим. Кроме того, очень важно, что мы не только общаемся на иврите здесь, но и пополняем свои знания об истории и традициях еврейского народа. Мы также хотим поблагодарить нашего преподавателя Люду Шапиро, которая очень грамотно и интересно подбирает темы для изучения, что тоже способствует нашим интересам к заседаниям клуба. Члены клуба разговорного иврита. г. Мелитополь Тамара Бондаренко, Елена Хохловкина. We, former students of the Melitopol Ulpan, want to thank the sponsors for founding Hebrew Speaking Club in Melitopol. The club gives us the opportunity to develop and strengthen our knowledge of Hebrew, acquired in ulpan. After all, if a language is not every day spoken, but is studied in the process, and knowledge is not strengthened in practice, then naturally the language is forgotten. Therefore, a club for people who live outside of Israel is very necessary. In addition, it is very important that we not only speak Hebrew here, but also replenish our knowledge of the history and traditions of the Jewish people. We also want to thank our teacher Luda Shapiro, who very competently and interestingly selects topics for study, which also contributes to our interests in club meetings. Хочу выразить благодарность руководителю клуба "А поговорить?!" Людмиле Шапиро за ее труд и творческие инициативы. Хочется надеяться, что меценаты и другие еврейские организации и в дальнейшем будут оказывать действенную помощь и поддержку Людмиле Шапиро в реализации ее планов и инициатив. Надеюсь, что в перспективе члены нашего клуба смогут принимать участие в различных проектах, направленных на укрепление культурных и экономических связей между Израилем и Украиной. Член клуба "А поговорить?!" Ярослав Грибиненко. I want to thank the head of the Club Lyudmila Shapiro for her work and creative initiatives. I hope that Jewish organizations will continue to provide effective assistance and support to Lyudmila Shapiro in the implementation of her plans and initiatives. I hope that in the future members of our Club will be able to take part in various projects aimed at strengthening cultural and economic relations between Israel and Ukraine. Member of the Hebrew Speaking Club “What’s about to talk?!" The club is great. We like it very much. The lessons pass easily and accessibly. Thank Lena and all the originators. It is an opportunity to study from the best teachers of Hebrew in Ukraine, likewise a nice choice to practice in conversation with others. Achieved knowledge is fastened right away. Hi dear friends! Thank you from all my heart! I like how lessons are being conducted and also the methods. Thank you for an opportunity to practice colloquial speech. There is warm atmosphere, interesting meetings, great mood. These are the reasons we come here, at the Hebrew Speaking Club. Thank you very much, Lena! Yesterday, a bright event was held in the Hebrew club: a meeting of Hebrew fanciers was held on the eve of the celebration of Purim, and the lesson was held by Elena Stamova, the head of the Jewish community of traditional Judaism Masoret. Those, who were present at the unusual lesson, read a small excerpt from Megillat Esther and, in their own words, tried to tell only in Hebrew what they understood in this passage. Of course, this proved to be a daunting task, but everyone was given a chance to read aloud something from the scroll in a holy language. Before the start of the lesson, for mood and relaxation and in full accordance with the tradition of Purim, everyone also drank some kosher red wine. Which, as a gift, was brought by members of the "Masoret" community. During the evening, Elena was speaking in Hebrew about the tradition of celebrating Purim: about the philosophical aspect of the holiday, as well as how to celebrate it among Eastern European Jews, as well as in Israel. After reading the scroll, the group was asked to change into fancy dress, and then each of the participants had to describe the costume of historical characters: Haman, Mordechai and Queen Esther. For the lesson were also prepared in advance special dictionaries on the subject: "Carnival. Clothes. Costume." All participants of the meeting described the costumes of their characters, as well as each other. Two and a half hours passed in a wonderful, friendly and very warm atmosphere. Thanks to all the organizers and participants of the meeting. Purim Sameach. On the day of the 70th anniversary of the State of Israel, the Hebrew Speaking Club "What’s about to talk?" had a wonderful meeting with a journalist Mila Lerner, who specifically came to Kyiv from Dnepropetrovsk to talk about how the Jewish media were created from scratch, how to attract readers, and not just a Jewish audience, even if the support of sponsors is not so large. Mine also told us how to write for clever people whom you hardly can surprise. Especially when your readers are writers by themselves, too. What are Jewish media? Jewish media are creative, ironic, analytical and local and history of the Jewish people. This article suggests that someone wants to know more about it. In the new Milla Lerner’s media, there you will find all that the Jews need today so that they can finally decide on self-identification. You may also realize that this is great and very exciting. 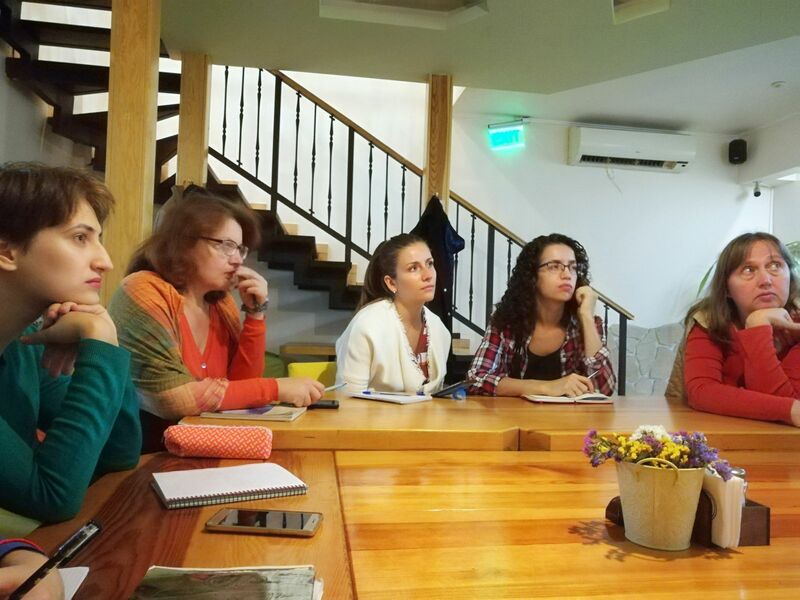 Project manager Elena Zaslavskaya invites everyone and those who love to talk to the club, meetings are held every Tuesday at the Kiev-Mohyla Academy on Voloshskaya Street 8 a.
Hello. Thank you very much for organizing and conducting the seminar. I wanted to write on the wall of your page, but decided not to do it without asking, so as not to break your rules. Thanks again! Thank you very much for the lesson! The past tense passed, they talked about childhood in Hebrew. Many new words. I liked that Lola does not allow speaking Russian. Just Hebrew. Very important for me, because I work in a Sunday school, and I study Hebrew and traditions with my children and parents. And yet, there were problems with communication, sometimes the sound disappeared. But in general - super!